“Just fence a farm and leave it alone. Come back in 10 years and you’ll find a thriving eco-system.” We hear a lot of such statements. Unfortunately, we are not wise enough to wait for 10 years and would like to do ‘some thing’ towards the creation of an eco-system – mainly for our own needs. Our farm land had remained unfenced on 3 sides so far and unused for the last few years. And it had become the grazing ground of choice for all the cattle nearby which has hardened the soil making it tougher for tender roots and other small organisms to penetrate. After we understood the importance of fencing, the choices were to go for a) concrete fencing or b)stone fencing with barbed wires in bettween or c)a living, green fence. Our main purpose was to protect the land from cattle grazing and not from trespassing humans. If someone wanted to break in, they’d find the means anyways. Options a) and b) didn’t have the right vibe to them and also quite expensive. A living fence held many exciting possibilities. We could use the excuse of a fence to plant thousands and thousands of green shrubs. It could serve multiple purposes and be easily mended by hand if broken or breached. The common notion of a living fence is a thin single line of something green. We’d like to look at it as an important cultivation area. The fence system consists of an outer trench and an inner trench (both 2 feet deep and 1.5 feet wide) with a walking path 4 feet wide in the middle. The outer trench has bunches of Jatropha and Nochi sticks on the outside and a row of closely spaced mulch trees (Gliricidia, Pathimugam, Moringa, bitter gourd etc) on the inside. We would like to plant more Adathoda (literally means ‘untouched by goats’ in Tamil) on the outer-most fence so this medicinal twine(excellent home remedy for coughs and colds) can weave and wind itself making the fence more lively and strong. The inner trench holds saplings of large, woody trees. During the wet season, the prices of veggies shoot up in general due to scarcity. We’ll attempt sowing seeds of gourds and other veggies so these climbers can use the long outer fence by the roadside as their framework. This way, surplus can be harvested by passers-by in need freely and we’ll not have to do any work other than sowing some seeds. It all sounds very romantic to me now but it was not an easy process to make a living fence come alive. It was not something we could buy off the shelf, assemble and forget about?. The farm was unfenced on 3 sides for a running length of approx 2500 feet. So Ragu spent many hours riding the bike and on the phone scouting for these shrubs in other farms, taking the consent of the owners, finding many different sets of people to cut, load, transport, unload and plant these sticks. Sometimtimes, he’d be the only one cutting and carrying many bundles of sticks. The double-trench, trees, shrubs and twines fence system can protect the farm from others’ cattle as well as keep our cattle in thereby protecting our farm and other farms from soil hardening and crop damage. In 2 years time, Gliricidia and Pathimugam which have been planted all along the inner boundary can be cut at periodic intervals to provide biomass for mulching and biogas in the future. The fencing shrubs serve as first line of wind breakers. The bio-mass trees which are slightly taller act as the second line and the even taller woody trees in the inner trench serve as the third line in an arching slope of wind breakers. We do get a lot of wind for 9 months in a year and we plan to have a lot of leafy trees like plantains ( that are easily felled by wind) inside the farm so this protection would be important. The timber from branches of trees like Nochchi and Pathimugam can be harvested for minor wood work like support structures for plants, constructing small sheds, dog house and for various landscaping purposes. When trees mature, the 4 feet walk path between the trenches will be canopied and much cooler than rest of the surroundings. This may be an ideal place to nurse new saplings, to take a walk or just nap. Many climbers that traditionally grow on the fence like Adathoda are used extensively in home remedies. We are in the process of collecting info and specimens of such local wonders. The fence is an excellent support structure and framework to grow climber veggies like gourds. And of course, the fence adds more beauty and life to the farm boundary. It is good to go around your region and find plants that grow from their branches. For example, our region has plently of Jatropha, Ponnarali and Nochi. We just cut 5 feet long branches and planted on our boundary. This creates an instant live fence. You can later sow seeds and saplings of plants that do not grow from branches in between the planted branches and grow a thicker fence. 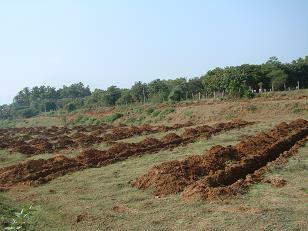 It is best to plant seeds just before the monsoon. Diversity is good in fencing material also. A minimum of 3 alternating varieties will reduce the attack of fungi and bacteria. For faster root growth, make a fresh, slanting cut on the bottom end of the branch before planting it. Horizontally, in the middle of the planted branches, place a strong but thin stick about 10 feet long and tie it every 2 feet. Repeat this for the entire fence. This is done to keep the planted branches from falling due to irrigation when they have not taken roots yet. Some branches (like Jatropha) can be lying around before planting for a week or ten days and they will survive upon planting. Other branches (like Nochi) must be planted the same or very next day of cutting. Fences need watering for the first 6 months or till the rainy season, whichever is earlier. So it is good to plan the water needs of fence (unlike us) for this period. If you are going for a drip system, and have a large area to cover, it is best to go modular and link the water supply of the fence to that of the adjoining parcel of land. One large system just to irrigate the fence may be hard to set up and may never get run in the assumed priority of things to do.